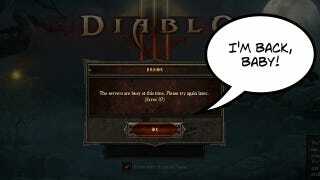 Diablo III's Error 37: "Don't Call It A Comeback!" Last night, Diablo III's Error 3003 may have been hot, but tonight, it looks like Error 37 is making a comeback! Like Derek Zoolander himself, Error 37 has risen from the ashes of last night's failed walkoff with so-hot-right-now upstart Error 3003 and emerged once more as the dominant Diablo III error. The original and best, as it were. At least now, Blizzard has set up a helpful server-status page so you can know for sure that you really and truly can't play the game right now. Which, as of this posting, you can't. For the third night in a row.